According to sciway.com, the term Sandlapper is a friendly nickname for South Carolinians. Charles S. “Charlie” Parham was a transplant to Berrien County, a “Sandlapper” originally hailing from South Carolina, and at other times living in Alabama , Florida, or Georgia. He came to live in Rays Mill, GA (nka Ray City) around 1898, when he was about 25 years old. Although he had just completed a program of study at the Georgia-Alabama Business College, he occupied himself in farming upon his arrival in Berrien county. His brother, Edwin P. Parham, had previously settled in Berrien County and was living at Rays Mill when enumerated in the census of 1900 and again in 1910. Charlie Parham farmed at Rays Mill for a couple of years and continued his studies. He does not appear in Rays Mill in the Census of 1900, perhaps being away at school at the time the census was taken. Around 1901 he spent a year in Abbeville, Ga attending Georgia Normal College and Business Institute. He taught many years in Berrien schools and served on the county school board. 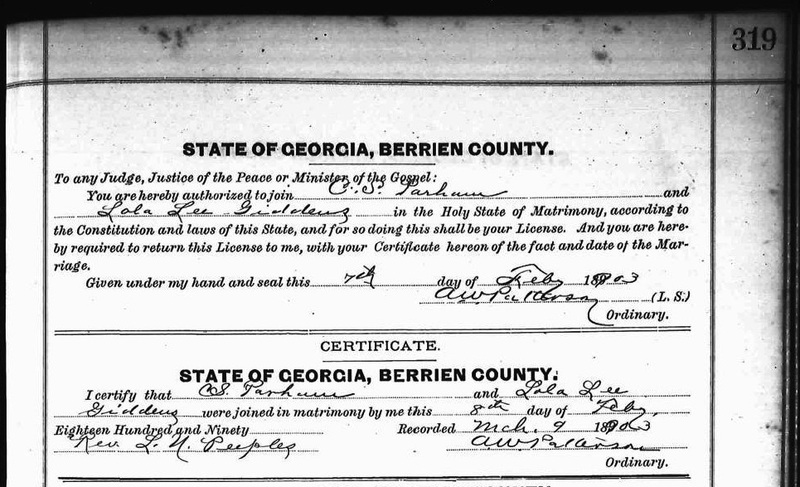 By 1902 Charlie Parham was living in Nashville, Ga and on February 8, 1903 he married Lola Lee Giddens of Rays Mill, GA. She was a daughter of Fannie Baskins and William Knight Giddens. In Nashville, Charlie Parham found employment clerking in the local stores. He also found time for public office and taught in local schools. In the 1920s, C.S. Parham was situated with Miller Hardware & Furniture Company, his name appearing on the company letterhead. At that time the firm had stores in Ray City, Nashville, and Milltown (Lakeland), GA.
C.S. Parham appeared on the letterhead of Miller Hardware & Furniture Company in the 1920s. In 1937, the Nashville Herald ran a biographical sketch of Charles S. Parham that included additional details. The subject this week is a South Carolina “Sandlaper” [sic] by birth, but a Georgian by preference. Mr. C.S. Parham, known locally as Charlie, was born and reared in Malboro county, S.C. in 1873, making him 64 years old at this writing. His father was the late C. J. Parham, who died in 1914 at 75 years of age, and his mother passed away in 1887 at 40 years of age. Both were natives of South Carolina and lived all of their lives in that state. At the age of ten years Mr. Parham moved to Florida where he lived for the next ten years. At twenty years of age he came to Georgia, enrolling at the Georgia-Alabama Business College in Macon. The following year he was graduated. It is strange to learn that prior to his business college education he had attended school only three weeks. The education he had acquired was soaked up through his teens of his own accord. He applied himself well for the chance he had. In 1897 he left for Montgomery, Ala. where he worked for a year. From there he came to Ray City, (old Rays Mill), his first time in Berrien county, where he farmed two years, and at the same time attending school at Lakeland (then Milltown). After that he took a teacher’s course at Abbeville for one year. Since that course he taught school off and on for twenty years. He came to Nashville to live in 1902, and here he has resided ever since. He first clerked for A. E. Bullard, General Merchandise, later taking a job in the store of S. T. Tygart, hardware dealer, which he held for over six years. During his time with Mr. Tygart he was elected Clerk of the Berrien Superior Court. This was in 1910. He served two successful terms, four years, then offered and was elected county treasurer. Before he could take over his duties, the office was abolished. This was his last time offering for public office. However, he has over the years served twelve years on the Nashville school board, and one term as city councilman. He is a member of the Nashville Baptist church and for years has been church clerk. In 1903 he was married to Miss Lola Giddens, sister of Rev. A. H. Giddens of Nashville. 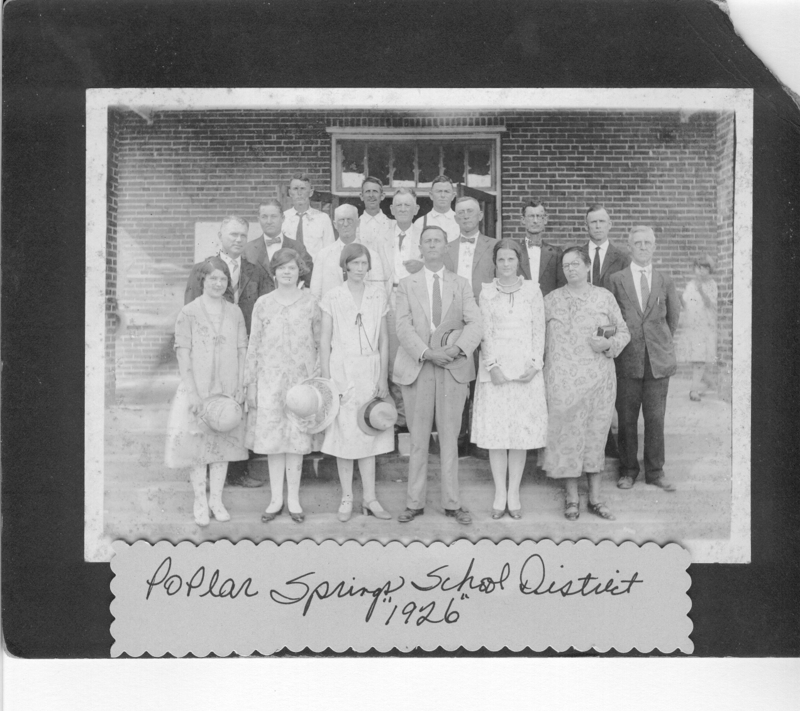 There are two children, Mr. C. V. Parham of Atlanta, and Mrs. Charles Norwood of Nashville. There is only one brother, Mr. E. P. Parham of Brooks county. Mr. Parham is strictly a business man, and does not have much time for foolishness. He does, however, like to go fishing when they bite, but does not care for hunting, explaining that there is always too much walking. He likes to see a good basketball game. He is known to be one of the county’s most able business men, attending to his duties, which practice has brought him success and financial stability. He is honest, clear-cut in his views and frank to say what he thinks and believes. No one can accuse Charlie Parham of being two-faced, the worst feature of so many. He will certainly call his shots as he sees them. This is one of his most admirable traits. At present he operates a number of farms near Nashville, and each year makes money. Mr. Parham is a good citizen, and Berrien county people are glad to know they have a “sandlaper” in their midst. He is highly regarded and for a very good reason.